We visited this park on December 6, 2016, and stayed for 16 day(s). 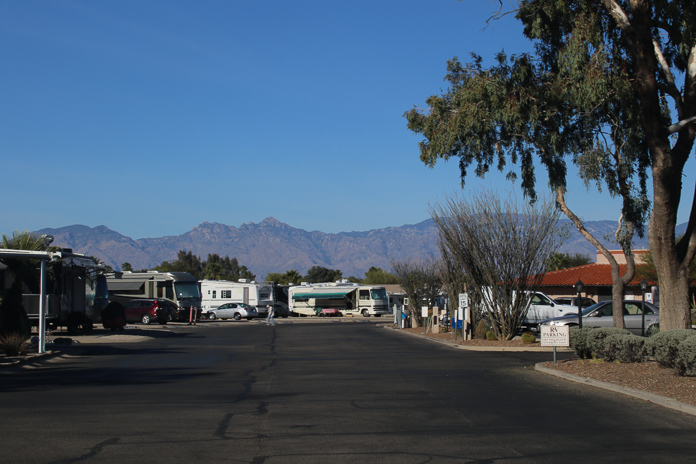 This visit marked two of three visits to Voyager RV Resort in Tucson, Arizona. We absolutely love this resort because it truly IS a resort, and would be a great place to spend an entire winter. There are activities for any interest, two pools, at least two hot tubs, an on-site restaurant and hotel, two nice laundry facilities, even a hair salon and clinic. This is more of a community than simply an RV park. Roads are wide with ample space for maneuvering big rigs. Sites are spacious, with concrete patios and picnic tables. It’s a huge park with something like 1600 sites. (Don’t quote me on that; I’ll have to double-check my numbers.) There are two dog runs, and dedicated roads where pets are allowed or not. We like dogs, so that’s not a selling point for us, but others might be happy to be in a pet free zone. Anna’s Hummingbirds and Broadbill Hummingbirds are plentiful in Tucson, and this one below frequented our window feeder several times each day. 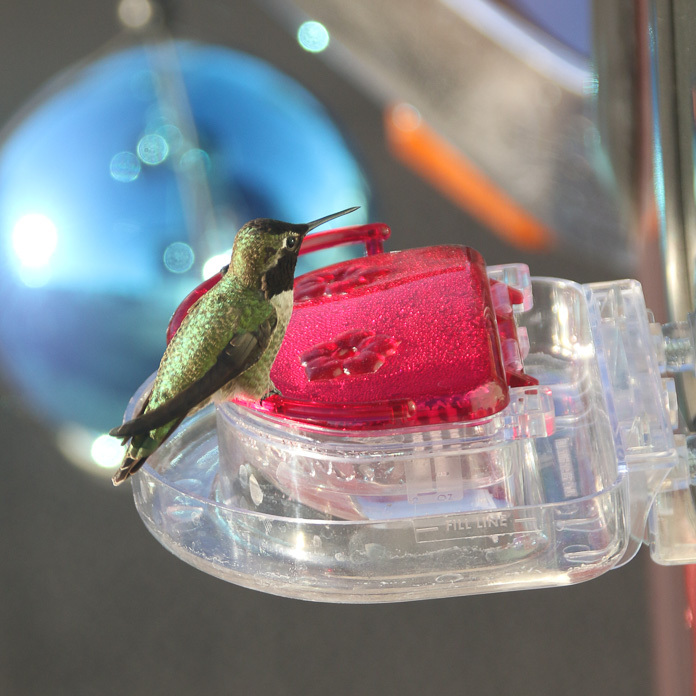 He’d hover near the feeder and watch us … maybe we’re the ones in a cage? There’s so much to do in the Tucson area: hiking, shopping, birding, exploring historical landmarks, scenic drives, etc. This park is central to all of it. Check out our Enjoying the RV Life Near Tucson blog post for some off-the-beaten path places that we enjoyed. The only downside: all of this comes with a hefty price tag. It’s an Encore park, so it’s available to us at a discount, but not enough of one to use it through that membership. Thousand Trails had a three month special of $1599 plus electricity, but the monthly rate was out of reach for us this year, and the weekly discounted rate by the time taxes and fees were added was well over $200. Some Thousand Trails members can get this park for only $4/night though, so if you’re a member, check your contract. We stayed for two weeks with Ready Camp Go and another week with Passport America, both considerably cheaper than the regular Encore discount for Thousand Trails members.